Before I met the man, I didn’t know what to expect. 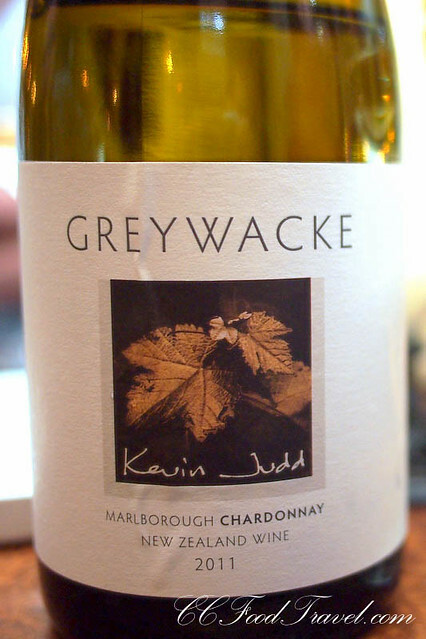 All I knew was that Kevin Judd, was a famous winemaker at Cloudy Bay for over two decades, and then left to launched his own label, Greywacke to huge critical acclaim in 2010. 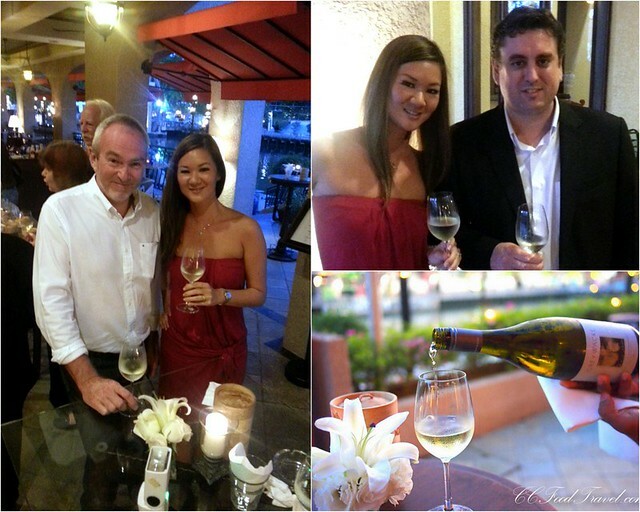 When we did get to finally meet him and have a chat, it was at Casa del Rio’s wine dinner in Melaka a week ago. I have to say, I am glad I met him. Not only is Kevin a humble guy, who is a talented winemaker, his is an avid photographer too. His evocative photography adorns the labels of his wines, and he is one of the world’s most acclaimed vineyard photographers, his work appearing in many titles including his book ‘The Colour of Wine’, and his website. 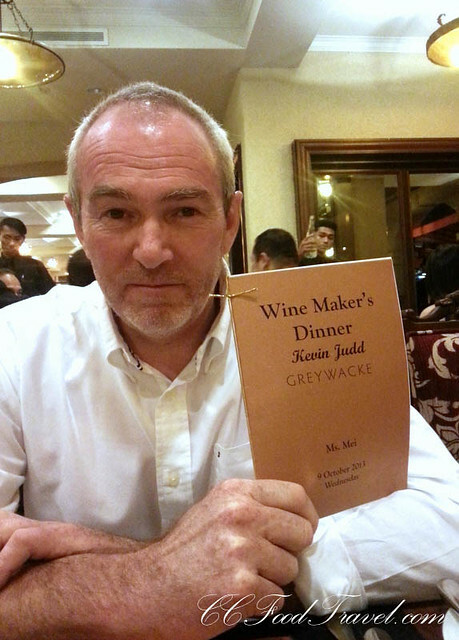 And the minute I got the chance, the first two questions I asked Kevin was why he left Cloudy Bay, and also, why the name “Greywacke”? He answered the questions easily enough though – Years of experience working at Cloudy Bay had already honed his winemaking skills to something that resembled perfection. When Kevin left Cloudy Bay after the 2009 harvest, it was an important milestone for him as it marked his 25th harvest as winemaker there. Cloudy Bay and him parted ways amicably but now, life is so much better, he tells us. Rather than having to work through a lot of red tape, now both he and his wife Kimberley, made all the key decisions, and quickly too. We had the pleasure of meeting Kimberley Judd as well, and she was a lovely lady with tons of wisdom, on wines and life in general, to impart. Kevin like so many other successful veteran winemakers, had decided to scale back and concentrate on smaller production of just a few wines that match the local terroir and they themselves liked to drink. 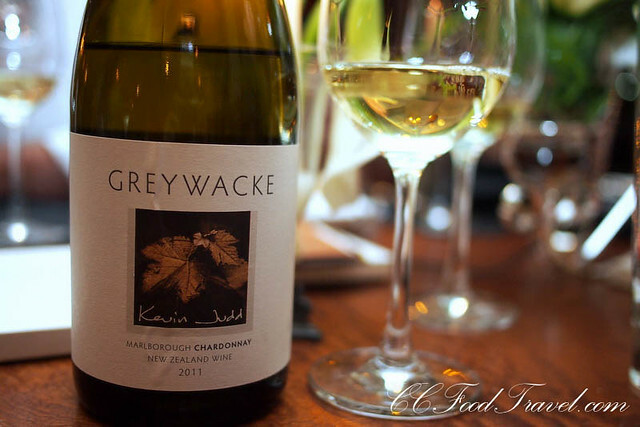 And the name Greywacke, comes from the rounded river stones, composed of compacted layers of grey sandstone and mudstone that are commonly found throughout Marlborough and all of New Zealand. So valued is Greywacke soil for growing grapes that some people might go so far as to call it New Zealand’s “national rock” even! 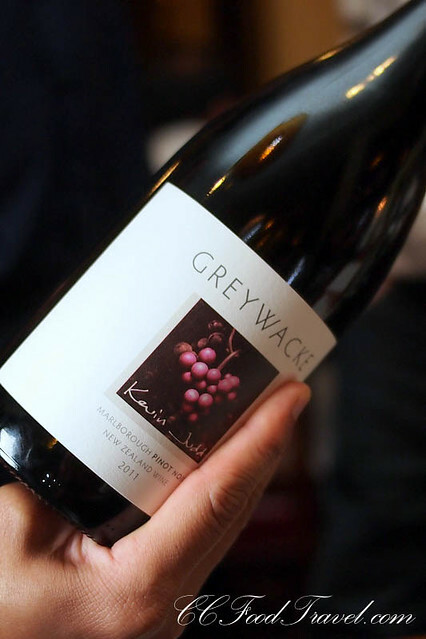 Greywacke is all about keeping things simple and fun, and that’s the experience you get as well, drinking the wine. And this time round, thanks to Casa del Rio Melaka partnering with Geovinum Sdn. Bhd., we would be guests of the Aarron Nelson (GM of Casa del Rio) to attend a Wine Dinner, hosted by Kevin Judd. 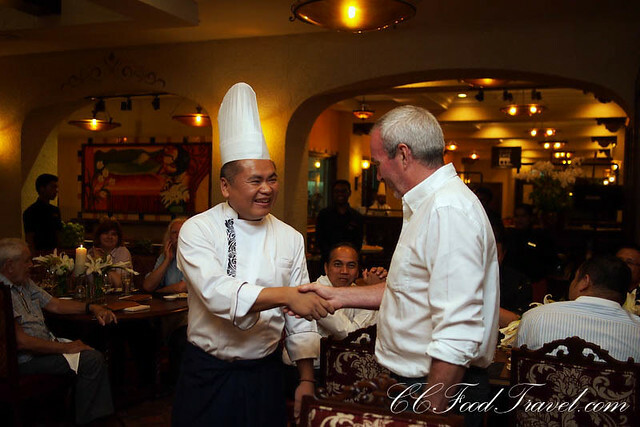 The meal had been carefully crafted and tailored to match the wines, by Executive Chef Allan Ho, of Casa del Rio. Sunset drinks at Casa del Rio by the river is such a classy affair. This is where, with a camera in one hand, and a glass of 2010 Greywacke Marlborough Sauvignon Blanc in the other, I grilled Kevin Judd and asked him a ton of pressing questions about his wines. Folks say that he’s shy, but we didn’t feel any of that. He happily answered all our questions, and with a smile too. Then it was time for dinner. First up, the appetizer. We were served Rice paper rolls of Scampi and Chicken, to be paired with the 2010 Greywacke Marlborough Sauvignon Blanc. 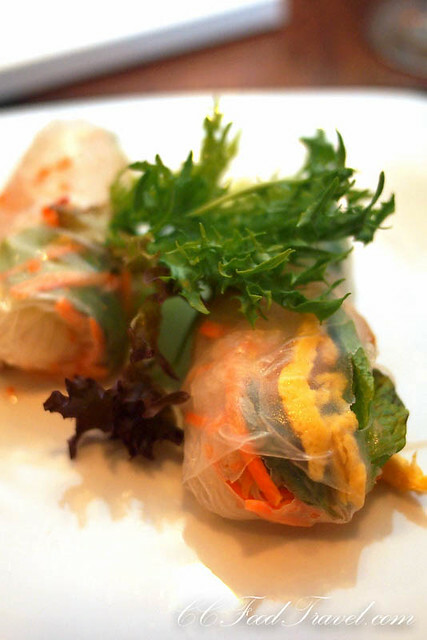 The Scampi and Chicken rice paper rolls reminiscent of Vietnamese rolls was light and refreshing. They could have done with a bit more sauce, but the overall pairing effect was good. Sauvignon Blanc remains Greywacke’s and Marlborough’s undoubted headline act. This wine that’s loaded with aromatics and flavors is such a delicious wine, you’ll find it hard to put down. Pungent fruitiness, zesty lime notes and crisp zingy acidity are just some of the adjectives that describe this wine. It really is a class act all on its own. 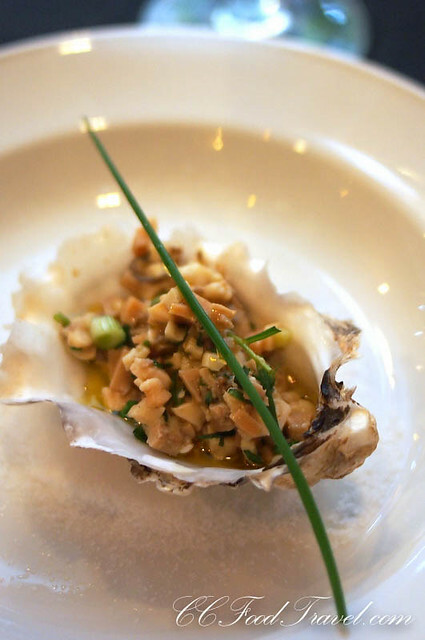 Next was a beautifully plated Tartar of Baby Abalone, flavoured with Spring onion and Tarragon, that was paired with the 2010 Greywacke Marlborough Riesling. The tartar of baby Abalone was not my favourite dish of the night. However, the Greywacke Reisling that was just off-dry, with a vibrant, crisp palate of wild honey and mixed spices was simply delicious. Its old barrel fermentation and lees aging probably lent it a rounded, complex texture. 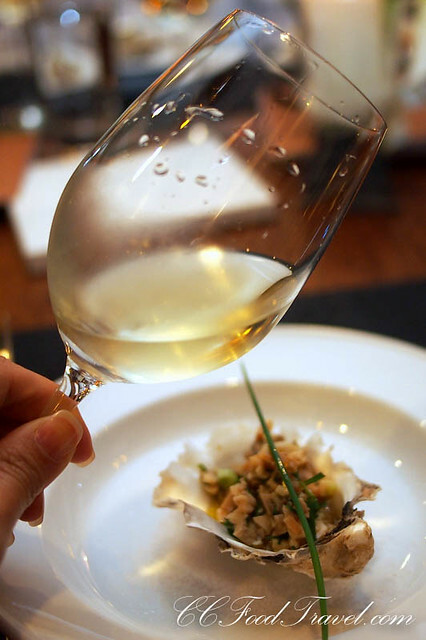 Loved the Reisling but didn’t totally love the way it paired with the Abalone. 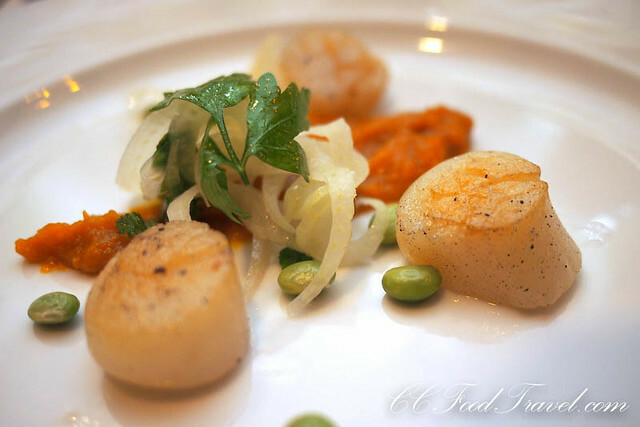 Mid way through the dinner, and we were served Hot Smoked Scallops tossed with Roasted Pumpkin, Fennel and Broad Beans paired with the 2010 Greywacke Marlborough Chardonnay. 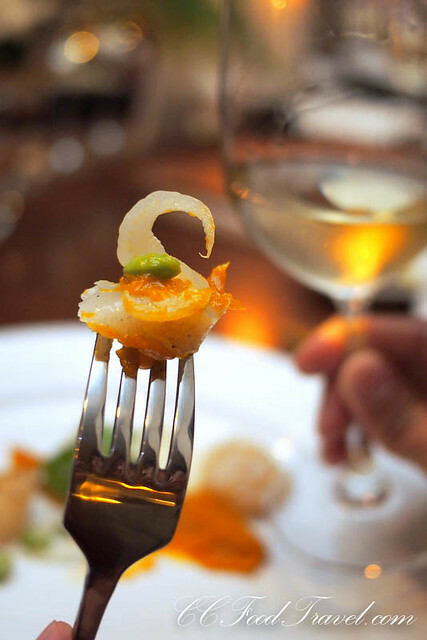 The smokiness of the scallop was the perfect pair for this flinty, savory Chardonnay. This was my favourite wine for the night. And you can see why Kevin’s Chardonnay is such a runaway success. Wild yeast ferment, complex, with a bit of matchstick minerality on the nose as well as ripe pear and peach fruit and some toastiness. 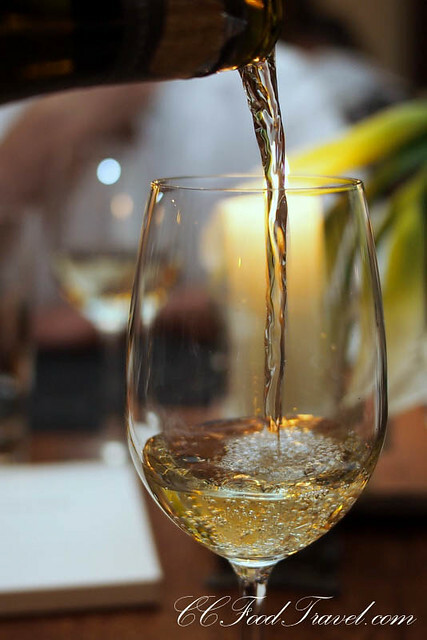 The palate is bold, full and concentrated, with nectarine, pear and spice notes. Totally loved the complexity and the acidity of this wine. 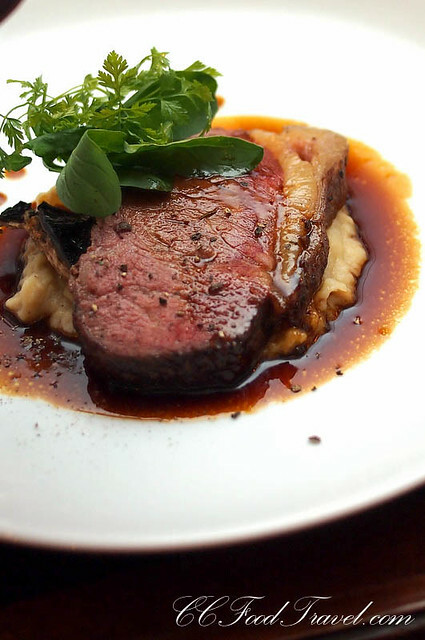 Then they served the Main Course – a Pan Grilled New Zealand Wagyu Beef Sirloin with Oregano, that was to be paired with the 2011 Greywacke Marlborough Pinot Noir. The Wagyu, served a gorgeous, juicy, pink medium rare, was faultless. Greywacke’s rounded and accessible style of Pinot Noir, characterized by soft tannins, sneaky acidity and buoyant fruit, was well complemented by this gamy, unctuous steak. 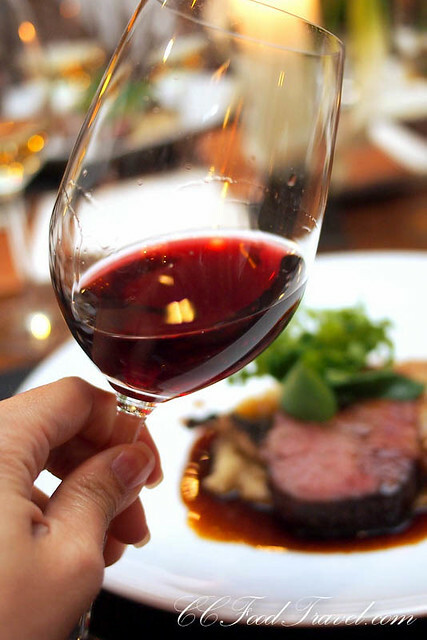 The earthy characteristics of the wine married beautifully with the hearty Wagyu. Loved the aromas of cherry and red plum that were gently infused with hints of vanilla, smoke and spice in this Pinot Noir. Chef Allan Ho makes an appearance to shake the hand of Kevin Judd! Finally, I was sorry to see dinner draw to a close. 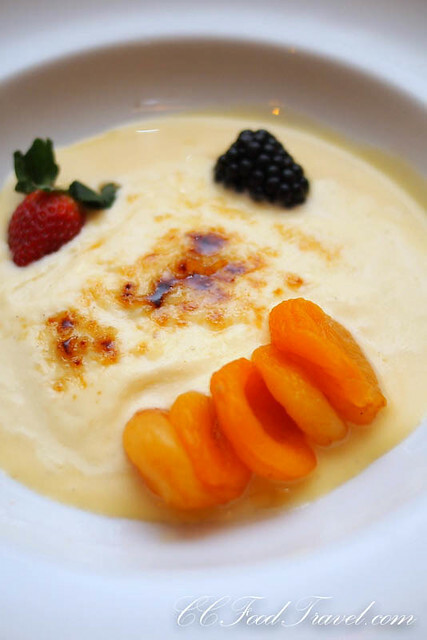 Dessert of Burnt Kapati Mascarpone Cheese, Vanilla poached Turkish Dried Apricot ended the meal on a high note. What a lovely evening. 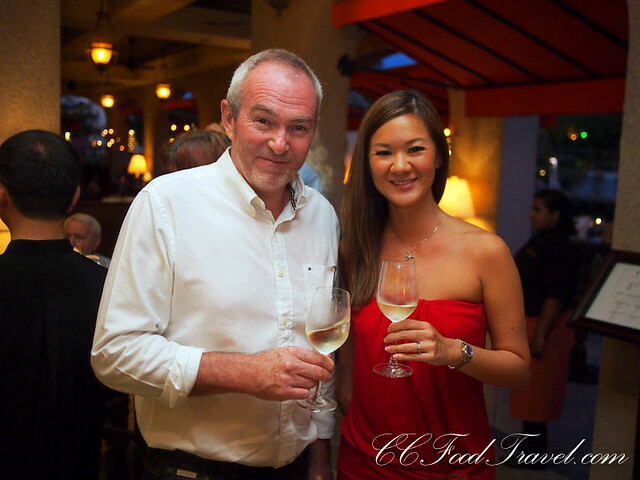 I was sad that it was over a little too quickly, but I knew I’d be seeing more of the Greywacke wines (and Kevin) at another wine dinner, to be held in Zipangu, Shangrila Kuala Lumpur later that same week. Greywacke wines paired with Japanese food.. hmmm, might be challenging, but I am sure that the boys were up to the task at hand. But that warrants a separate post on its own, so stay tuned! A big thank you to Aarron Nelson for extending the invitation and for hosting us at his hotel. It was an incredible, unforgettable night indeed. Awesome shots as usual! Certainly a lovely experience of driving out of town for a wine pairing dinner. 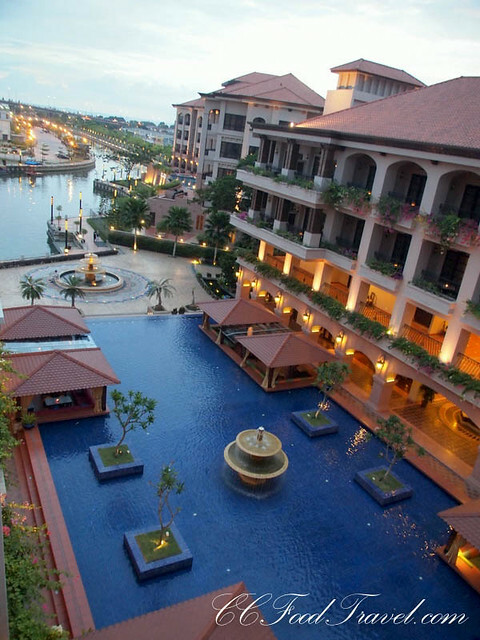 I might have to hit up Melaka just to make this restaurant. Top Cocktail Bars to unwind at on Humid Weekends!